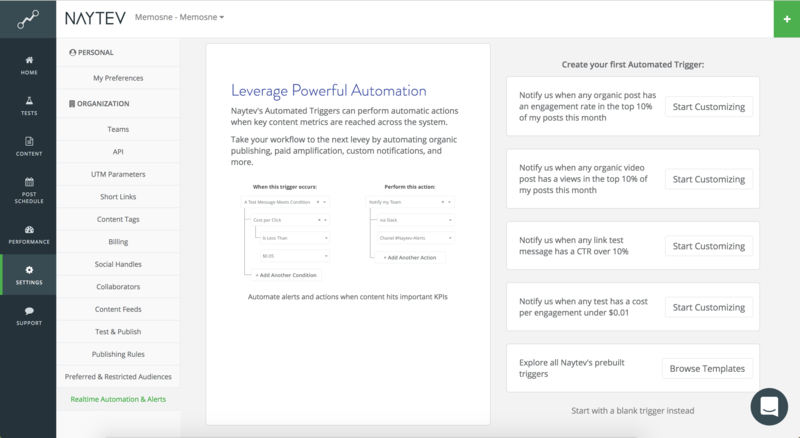 Create, edit, delete and clone custom triggers conditions and actions for your content. Performance Triggers exist to streamline your workflow. Learn how to manage your Actions and Alerts here. To create a custom performance trigger navigate to the lightning bolt icon and click on it to be brought to the Automation Configuration Page. Choose between using our pre-created templates or start creating performance triggers from scratch on your own. To begin click on the "Start with a blank trigger instead" Link. After you click on the link, you'll be given the fields to create your first Performance Trigger in Naytev. Name your performance trigger with a descriptive title. Then use the first highlighted dropdown to define your trigger source. Your source tells Naytev what to monitor. You can set the source to be your organic content, your tests, or a specific message within a test. TIP: We can track all organic content on your Facebook page, not just content posted through Naytev. After you've defined your source select the metric you want to track in the auto-generated dropdown. TIP: You can see what metrics are available for each social handle by taking a look at the icons underneath each metric. Once your metric has been selected, choose an operator in the third dropdown. The operator defines threshold you want to set. We offer Greater Than, Less Than and X% statements for you to define the specific metric values you want to track. For example, if you want to track content that has a CPC of .05 cents or less, you would select the Less Than operator. Alternatively, if you want to be notified if content has a 10% or above Engagement Rate, you would select the Greater Than operator. Finally, set a value that you'd like like your trigger to activate on. The value that you set will be the bar that Naytev will measure all outgoing content against. For the Greater Than and Less Than operators you'll have to define a numeric value that you want Naytev to measure against. For the Top and Bottom X% you'll have to define the percentage of your content you want to identify and a time frame that you want to track. We calculate all data on a rolling basis over 7, 30, or 90 days. Once the final value has been set, you have the freedom to add multiple trigger conditions drill down on specific pieces of content. 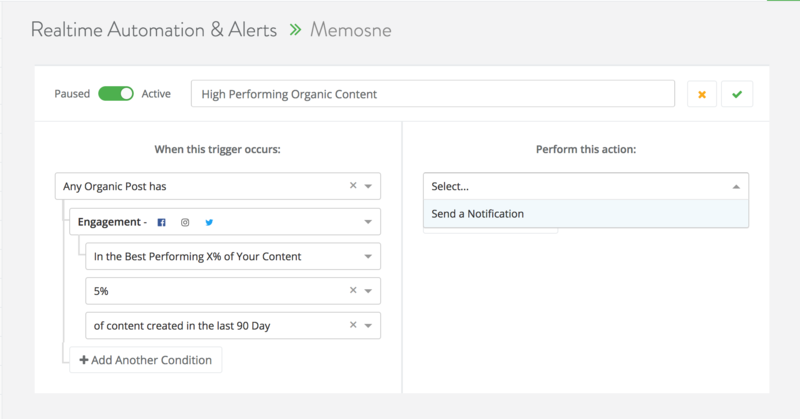 For example, you can set a Performance Trigger that requires content to have a combination of a high engagement rate and over 50 shares before any action is taken. For multiple condition triggers, you can choose to activate the notification when all conditions are met or if any conditions are met. After you've defined all your trigger rules and thresholds, you still need to define the actions associated with your Performance Trigger Conditions. Define all actions within the "Perform this Action" column on the left-hand side of the page. Click on the first dropdown and select "Send a Notification." In the next auto-generated dropdown, you'll be able to select whether you want to receive your trigger notification by email or Slack. Select "An Email Address" in the secondary dropdown and input the email that you want to send all notifications to. This can be your personal email or a team email. If you'd like to send the notification to multiple recipients click the "+Add Another Action" button and choose "Send a Notification" > "An Email Address" and then enter an individual. Repeat these steps as many times as necessary. Make sure to save you changes by clicking the green checkmark in the upper right hand corner. Push all Performance Trigger Notifications to a private or team slack channel. In the "Perform this action" column select "Send a Notification", and then "To Slack" in the secondary dropdown. A pop-up will appear. Please follow the all prompts and give Naytev permissions to access your Slack Account. Once Naytev has access permissions to your Slack Account, we'll automatically pull in all existing Slack channels that Naytev can push notifications to. Select your ideal channel and save your settings by clicking the green check mark icon in the upper right hand corner. We've given you the option to "pause" your performance triggers and stop the associated trigger actions from firing. 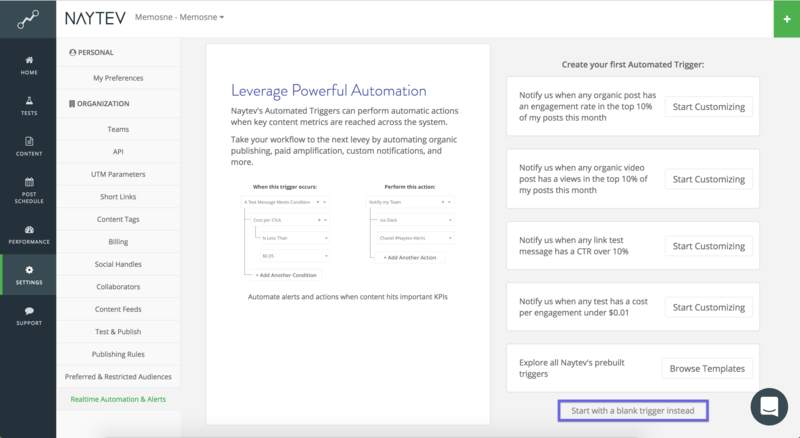 Create as many Automation Triggers as you want and pause any that need to be used for specific campaigns or at a later date. If you want to make any changes to an existing performance trigger click the "..." button in the upper right hand corner and select "Edit." You'll be able to manipulate all drop-down fields and delete individual trigger conditions and actions. Once you're satisfied with your edits save your progress by clicking the green checkmark button in the upper right hand corner. You can clone a Performance Trigger by opening the "..." button in the upper right hand corner and selecting "Clone." Use this to easily build off an existing notification's structure if you need to switch social handles, modify metrics, or want to keep a specific trigger condition and action combination. You can delete any notification triggers by clicking the "..." button in the upper right hand corner and selecting "Delete." A pop-up will appear to confirm your choice.